Reviewers notes: We originally reviewed this beer on February 27th, and we believe we did so with either an outdated, or poorly stored bottle. We re-reviewed after Dan Kenary, Harpoon's President, graciously sent us some just-bottled samples. 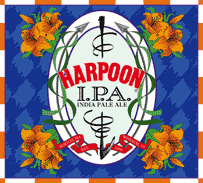 The IPA pours a medium amber color, crested by a large, off-white fizzy head that becomes foamy after it settles. Active carbonation throughout the body. Excellent lacing left behind as the head begins to diminish. Nose is of fresh hops with a perfume notes, as well as hints of grass. Initial taste is very well balanced, with a smooth, medium bitter beginning receding to a light bitter finish that lingers well on the mouth. Soft carbonation left on the mouthfeel, watery consistency leaving a dry palate behind.